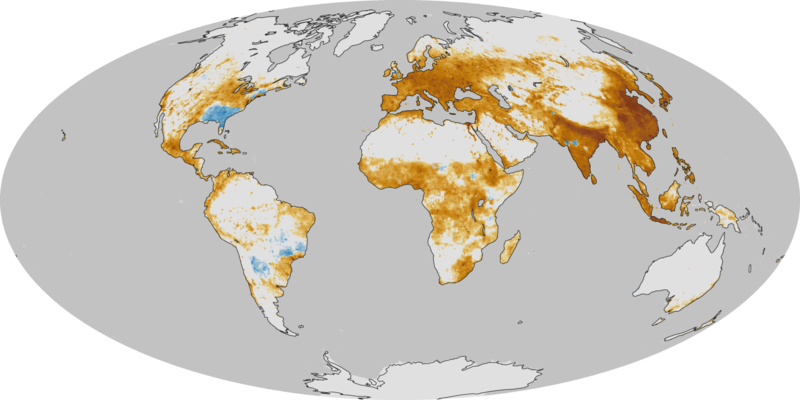 A new NASA map of the planet lays out the depressing geographies of smog and premature death. Where on earth are you most likely to die early from air pollution? NASA provides the answer with this mortally serious view of the planet, and it is: lots of places. Like tar stains on a healthy lung, the sickly yellow and brown areas in this visualization represent regions with significant numbers of pollutant-influenced deaths. Heavily urbanized places in eastern China, India, Indonesia, and Europe are stippled by the darkest colors of snuff, meaning they experience rates of ruination as high as 1,000 deaths per 1,000 square kilometers* each year. In good news, areas painted in blue show where humanity has managed to lower its output of choking smog since the 1850s. These safer havens include spots in the middle of South America and the southeastern United States, where the amount of agricultural burning has decreased since the mid-19th century. In most cases, the most toxic pollution lingers for a few days or even weeks, bringing increases in respiratory and cardiac health problems at hospitals. Eventually the weather breaks, the air clears, and memories of foul air begin to fade. But that’s not to say that the health risks disappear as well. Even slightly elevated levels of air pollution can have a significant effect on human health. Over long periods and on a global scale, such impacts can add up.